The recent criticism of restructuring the EGIP railway electrification project to bring Scotland’s key intercity track out of the 19th century rather misses the point. As with the rest of Britain, we think that throwing money at individual lines in the worst pork-barrel tradition will someone leave Scotland with a modern transport system. Almost every new rail investment has underestimated the demand. But that’s not necessarily a sign that we’re getting it right. It could be that demand is so huge, almost any new line will succeed. Today sees the publication of a paper by Transport Scotland on a Smart and Integrated Ticketing Strategy. Sounds good—great in fact: it’s not just God who loves a sinner come to his understanding. Given the scale of the issue, its 18 pages are light on substance and reading them poses more questions than they answer until you realise that we’re only discussing smart—not integrated—ticketing, which is a shame. What we seem to be aiming for is McOyster and little else. People want to get from home to/from work or shops or friends as direct as possible. They will do that by the easiest means (and in the least time if it is repeated often). Price is a factor but convenience/speed much more so. Universal direct public transport links are, by definition, impossible. But any transport system worth its salt will minimise interchanges required and the distance/time needed at each. Currently there are no systems in Scotland worth the name—trains and buses operate on different planets, let alone ticket systems or timetables. The result is a mess—and an expensive mess at that—which results in people piling into their cars in droves. Look at any decent-sized city in Europe and its public transport will put Edinburgh to shame. From Amsterdam to Zurich one ticket gets you around a logical, integrated web of trains, metro, tram and bus, cascading from one to the other in a linked plan. By contrast, in Edinburgh, almost 90% of its 123,000,000 annual passengers rely on the slowest, least efficient form of public transport—bus. Good though Lothian buses may be, they have no real competition, with neither metro, nor suburban trains worth the name within the city. The other 10% use ScotRail & First services from the Lothians and Fife. 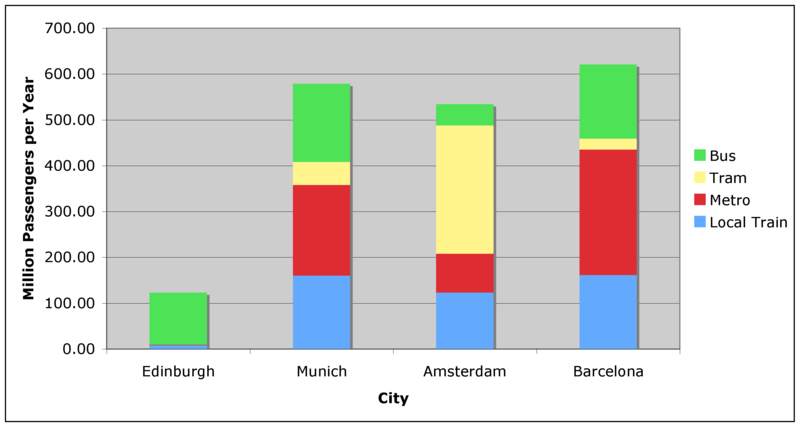 But comparing Edinburgh with European cities is an exercise inviting serious ridicule. Reliant almost entirely on buses which are then choked by the cars people use in frustration, Edinburgh is a pygmy in transport and decades behind comparable cities. Even allowing for its population (500,000) being the smallest of the four, its still grossly outclassed per head. But what is worse, the reason the Europeans are so far ahead is that all three other cities ditched the competitive private profit shibboleth vampiring on investment and hobbling growth here by picking transport organisations up by the lapels and making them work seamlessly together. 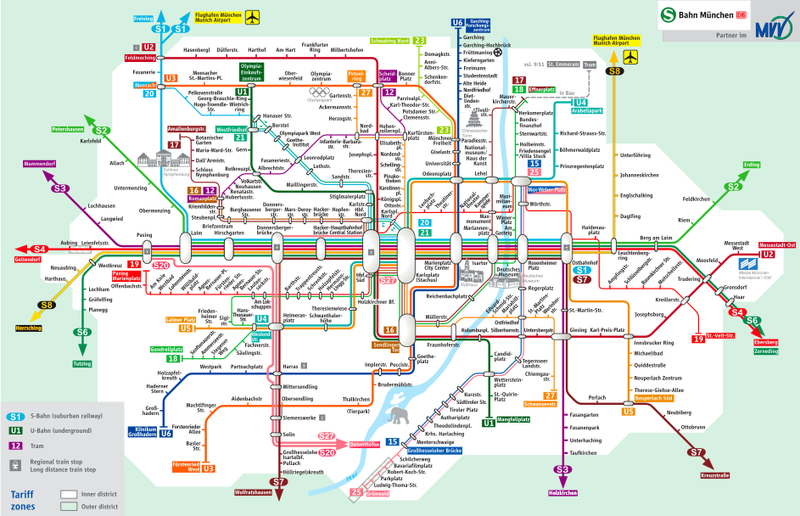 as a result, the MVV in Munich has run a slick single-ticket system for the last 40 years. Together with linked services, it’s what lures people from their cars. insisting toothless SESTrans/SPTs earn their pay or get their jotters. And, in case you think this is being unduly harsh, insisting on transport value for public money, the future ridership stats for Edinburgh’s £1bn tram system are included in the graph above. It’s just they’re so small you can’t see them. Embra-rassing stuff! This entry was posted in Transport and tagged public transport; single ticket; integrated system. Bookmark the permalink. Oh my goodness! Incredible article dude! Thank you, However I am going through troubles with your RSS. I don’t understand the reason why I cannot subscribe to it. Is there anyone else getting similar RSS issues? Anyone that knows the answer can you kindly respond? Thanks! !